That we are only 20 minutes away from the International Falls airport that is serviced by Delta Airlines from all major cities in the U.S.
For the person who does not mind doing his own cooking and would enjoy "roughing it" a little, our fly-in deluxe outpost cabins would be the trip for you. Each cabin is equipped with running hot and cold water, hot showers, wood heating stove, gas cookstove, gas refrigerator, solar lights, barbecue grill, eating and cooking utensils, large comfortable bunks with mattresses, large 14’aluminum boats with padded swivel boat seats, 6 hp Yamaha outboard motors, and an unlimited supply of outboard gas. We have a basic five-day fly-out the morning of the sixth day package plan. Extra days are $100.00/per person. For trips less than the five-day plan subtract $25.00/person/day. 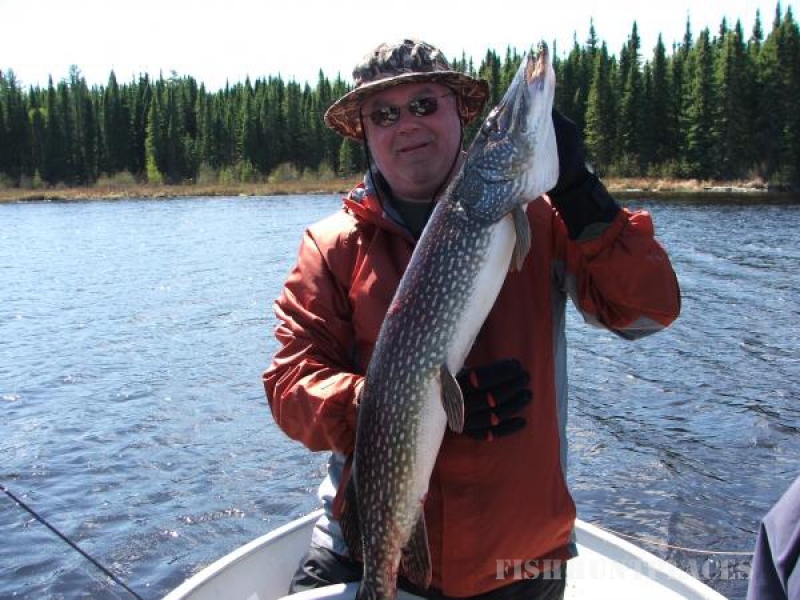 If you are interested in American Plan Lodging accommodations with great fishing click here ! Attention Sportsmen: To show our appreciation for over 35 years in the fly-in fishing industry, we are offering the following fishing package this year to the many thousands of fishermen who have made us so successful. * For reservations at any of our many outpost cabins, parties of 4-6 paying guests can bring a son, daughter, or guest under the age of 18 and recieve a $300 discount . We are doing this because the young fishermen are our future. 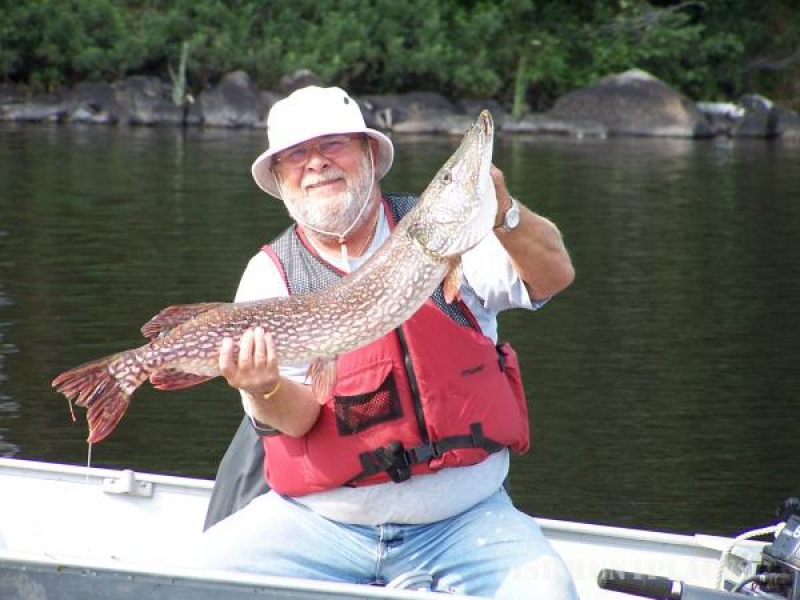 So come on fathers and grandfathers – bring your son or daughter on a fishing trip that they will never forget. Use a 5-5 1/2 foot rod with medium action spinning gear with 6-8 lb. test line. Do not use swivels and leaders: tie the line directly to the jig. Use as light of a jig as possible where you can feel the bottom. 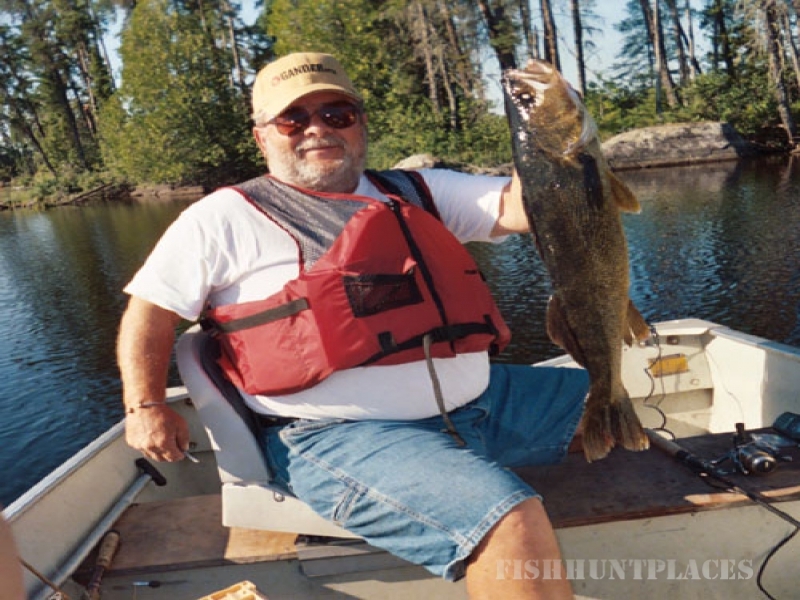 A beginning walleye fisherman may have to start with a 3/8 to 1/4 oz. jig and then several fishing trips later may get the feel of a 1/8 oz. jig. You do it by feeling that jig hitting the bottom over and over. You get better the more you fish. The most popular jig colors are: Chartreuse, yellow, white and pink. 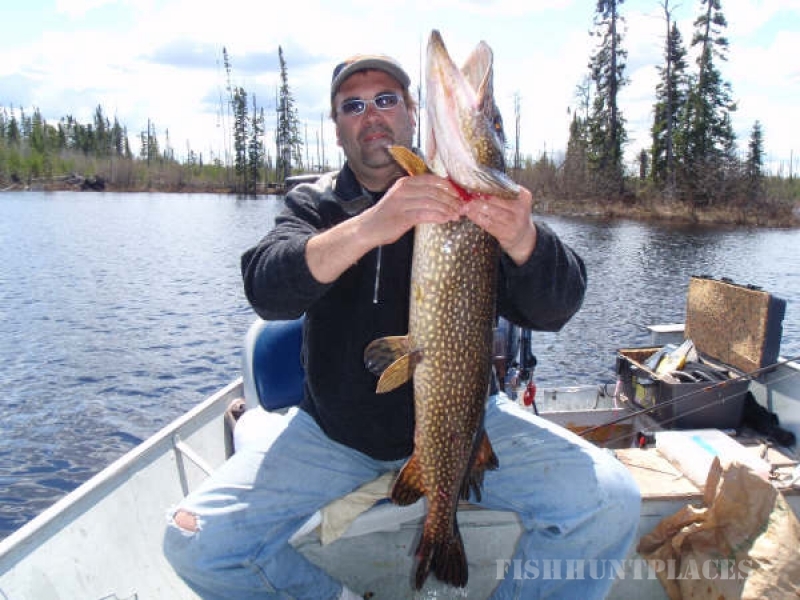 Put a minnow, leech, or night crawler on for bait and walleye fishing is as simple as that!!! 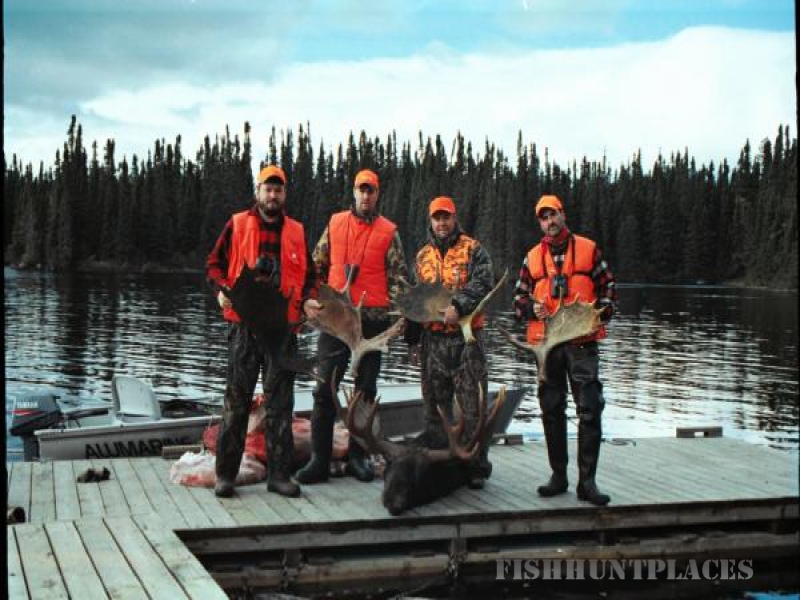 We hunt one of the highest known moose population areas in Northwestern Ontario. Limited to outfitters only, we are allotted a certain number of tags. This ensures that we will always have a high moose population and gives the hunters the best opportunity to score. Please call or write for information and costs on this hunting trip. 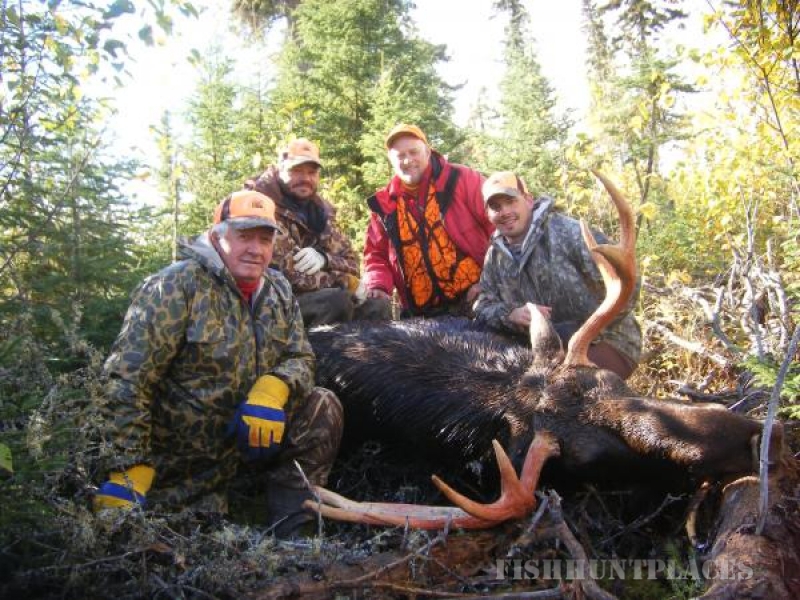 These moose hunts are from our remote outpost cabins in several different areas of Northwestern Ontario. Our moose hunts are more of a "Do It Yourself Hunt". We supply your flight in and out, flying your moose back to our airbase, fully equipped cabin with hot and cold running water, boats, motors, gas and maps of the lake and hunting area. You supply your own food. The cost is $3500 US Funds per person for a minimum party of 4 hunters. Any less and the cost will be $4500 US Funds per person. This price includes flight in and out, flying out moose, moose licenses and all government taxes. Because you can party hunt in Ontario any member of your party can shoot an adult moose, bull or cow , as long as a member of your party is in possession of an adult tag. Our early season hunt starts around September 15th, and runs through to October 4th. These lakes are located 180-200 miles north of our airbase. We have bull and cow tags available on Birch, Mink, Richardson, and Tew Lakes. Our second season hunt starts around October 9th through October 21st. These lakes are located 150 miles north of our airbase. We have bull and cow tags available on Glitter, Dunne, Pipio, Dasant, Moberly, Holly, Lil Shab and Sesikanga lakes. All of our moose hunts are a 7 to 10 day trip. We like to fly our hunters in 2 days before the start of the hunting season to give everyone a day or two to scout the area. We only hunt one party per season on each lake to ensure the best success for that party and to ensure that the area will remain excellent hunting for the future years. These are fly-in areas with only a few permits issued each year.